If your summer travel plans have you heading for Washington, D.C. with the family, take note: construction teams have been–and will continue to be–very busy in the Nation’s Capitol. The building, which takes up two square city blocks, became home to the Patent Office in 1842 and was completed in 1867. It has gone through many changes over the years: Several architects contributed to the final design, and parts of it were rebuilt after being damaged by a major fire in 1877. In the 1950s, it was slated for demolition to make way for a parking lot. After a successful campaign to save it, the building was renovated and transformed into a museum space. The price tag for the renovation: $300 million. After Labor Day, the Smithsonian’s Museum of American (home of patriotic symbols like the Star Spangled Banner and icons of popular culture like Jerry Seinfeld’s “puffy shirt”) will close for a two year renovation–at least. 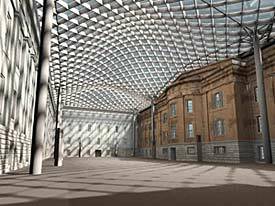 As one of the most popular museums in the city, with three million items and thousands of galleries, the improved building will have better infrastructure and more accessible displays for the crowded attraction.